TiAl-based alloys have not only excellent high-temperature strength, high-temperature creep and oxidation resistance, but also low density and high strength-to-weight ratio, having extensive application prospect in the aerospace and automobile industry. 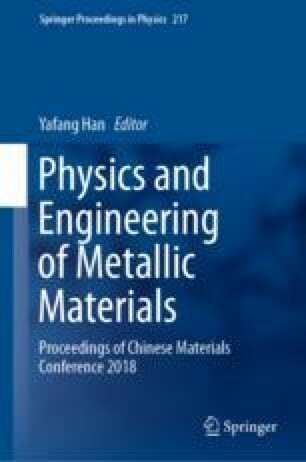 In this paper, the single-phase γ-TiAl-based alloys were studied. In order to refine the coarse microstructures of single-phase γ-TiAl-based alloys, three different kinds of γ-TiAl-based alloys, including Ti–54Al (at.%), Ti–52Al (at.%), and Ti–50Al (at.%), were melted and homogenized at 1150 °C for 36 h. The effect of composition on grain refinement and grain boundary distribution of single-phase γ-TiAl-based alloys were investigated. The results showed that the grain size of the alloys was refined with the increase of aluminum content after homogenizing treatment. In addition, the grain boundary character distribution was non-uniform. Inside the columnar crystals, there were a large number of coherent Σ3 grain boundaries. The derived capacity of Σ3 grain boundaries was poor, and general high-angle grain boundaries were connected to each other.